Random Noodling: Poetry Friday--"Just Because"
Over at Michelle's My Little Ditty, she is running a monthly poetry challenge. November's was posed by children's book editor Rebecca M. Davis. Ms. Davis suggested writing a poem of kindness. Now, you may ask yourself, how is smiling through a kids' concert a kindness? This, was drawn from a past experience (30 years ago? )when my son "learned" the recorder in elementary school. His class then performed for their families and friends. All I remember was having to hide my face in my daughter's back (she was on my lap) during "Hot Cross Buns." It was a series of squeaks and squawks that absolutely cracked me up. I bless the grandparents who managed to maintain a pleasant smile. Wee Words for Wee Ones will be hosting the Poetry Friday Round-Up this week. Do stop by! Love that you put this into a collage piece, Diane. I love those little bits of kindness. They mean a lot. Love this sequence and the way you've illustrated it. I especially loved the Hot Cross Bun one, and got it immediately, even without your explanation. I'm glad you did, Sally. With haiku being so brief, I wonder if half of what I write is totally meaningless to to others! Love the montage effect, Diane, and the overlapping sprinkler pulling it all together. Great job! It's quite an old-fashioned sprinkler, as are the rest of the pictures, too. I love the old illustrations that are in the public domain and that are made available online. Diane, I just discovered your Kurious Kitty link in the roundup is also coming here. Thanks, I added the correct link. Totally love this beautiful collage and all the sentiment contained in your words, Diane. Wow! Enjoyed hearing that anecdote about your son's recorder performance :). Many elementary school concerts were "enjoyed" in this way. Thanks, Bridget! Some of the illustrations were a bit more difficult to find. Like that photo of the little band--I was simply looking for an illustration of a recorder being played (which I didn't find). Wouldn't it be amazing to do that each month for a year... or every year. A wonderful snippet of haiku thanks for the year! I am going to try that this coming year. That's a nice idea, Donna. A little poetry and kindness challenge for 2016. Totally frameable! 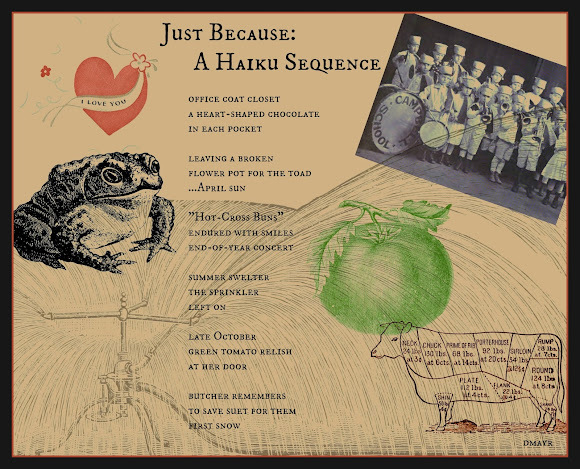 Thank you so much for sharing your haiku artistry in words and visuals. Your concert explanation reminded me...Embarrassed to say I literally stifled my son's music lesson; shoved a towel into the open end of his saxophone...It was either that or shipping him out in the cold to practice! ...If only those days were back...God bless you! Well, my son's band practiced in the garage, and a garage in the winter in New Hampshire can get mightly chilly! Diane, Hot Cross Buns recalls memories of the recorder and flute but by the time my daughter reached HS she was 1st chair and all was a beautiful flowing tone. This haiku sequence is wonderful. I have a haiku today and would love your feedback. http://beyondliteracylink.blogspot.com/2015/11/thankful.html. I'm happy your daughter found her instrument of choice so early. I stopped by your blog, but I would like to proselytize a bit about haiku, so contact me directly if you're interested. Enjoy this end of fall day. I am happy to listen, Diane. I tried to DM you on Twitter but you aren't following me so I can't. Shall I try email?